Be sure to use the parchment paper when baking so your crisps won't stick to the pan. Spray oil isn't enough. 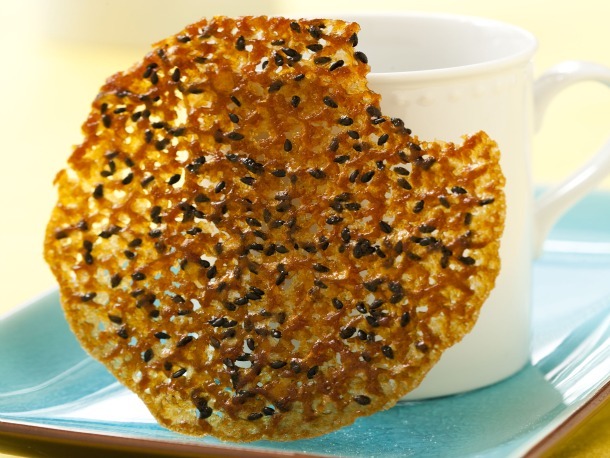 I love these crispy, not too sweet cookies to finish off an oriental meal. 1. Using a stand mixer fitted with the paddle attachment (or a handheld mixer or a wooden spoon), cream the butter until creamy and light, about 2 minutes. Add the granulated sugar and brown sugar and continue to beat on medium speed for about 1 minute, or until combined. Turn the speed down to low and add the flour and mix until well combined. Slowly drizzle in the orange juice and mix for about 30 seconds. Transfer the batter to an airtight container and refrigerate for at least 4 hours or for up to 1 week. 3 Pinch off rounded tablespoon-size balls of dough and place on the prepared baking sheet, spacing them at least 3 inches apart to allow for spreading. 4 Bake for 16 to 18 minutes, or until the cookies are completely golden brown throughout. Let cool completely (they must be firm to the touch) on the baking sheet on a wire rack. Gently remove the cookies from the parchment. 5 The cookies can be stored, in layers separated with sheets of parchment paper or waxed paper, in an airtight container at room temperature for up to 3 days.